This will be the 8th straight EmTech event held in Europe with the event being held in Toulouse since 2015. The inspiration behind the event was to create meeting point of the most creative and innovative minds, researchers, businessmen, VCs, as well as up-and-coming companies and startups. This conference is a space to learn about the applications of new and disruptive technologies that are changing the world and is an opportunity to be part of the trends that will shift the disruption in years to come. Start&Meet-Up is a competition that aims to recognize innovation—the development of new technology or the creative application of existing technologies to solve problems or add value. At this competition, major French and European experts in technology, entrepreneurship, and innovation will be at EmTech Europe to present ideas, advice, and will take part in selecting the Best Tech Startup of the year. This event will bring 10 selected startups that will have the opportunity to present their projects to the audience of EmTech Europe. On the second day of the event, sectoral challenges will be presented where we will apply Design Thinking Methodologies to develop solutions to the most pressing challenges projected into the society of the future. You will engage in debates and dynamic activities that will give you the opportunity to participate in high-level networking with attendees, speakers, experts, and researchers in different fields. These activities add value to the problem resolution that will generate ideas with the potential to change then world. These solutions will have a significant impact on both the industries as well as society. These solutions will generate change and will enable the forecasting of applicable improvements that can be made in industries to avoid future problems. By collaborating together, we can co-create solutions to help solve the challenges presented by the Society of the Future. 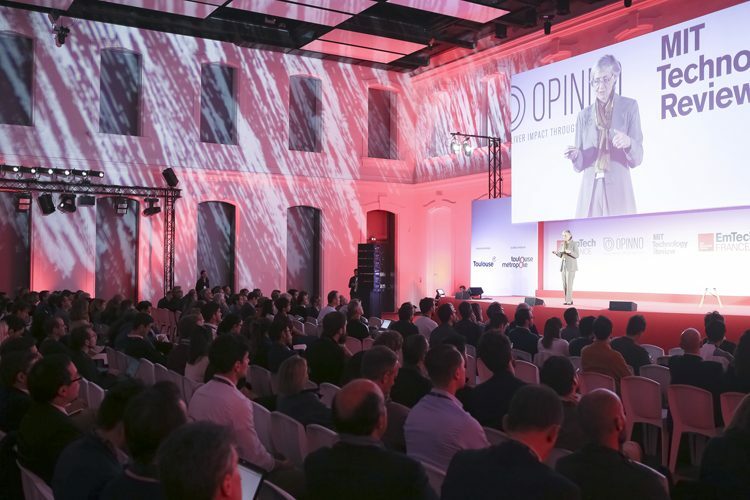 The format of this conference enables attendees to be immersed in the keynotes, participate in activities and demos as well as network with the Innovators, creators and game-changers coming from different industries and sectors. Make sure to follow our social media pages (Facebook: Emtech Europe, Twitter: @EmTechEU Linkedin: EmTech Europe) This will keep you up to date with all the news about the event such as: speakers, ticketing discounts, and other exciting news! the Early Bird ticketing discount will be the last discount that is automatically applied to purchases for all attendees. After the 26th of August the only discounts available will be those given by Opinno.